Nationally recognized "green" interior designer Trudy Dujardin (Dujardin Design Associates, Inc.) is featured in the April 2012 Traditional Home magazine's section on Greenspace, with a feature on her newly renovated, sustainable beach home on Nantucket Island. "A healthy home is the ultimate luxury," says Trudy Dujardin. When Trudy Dujardin, ASID, president of Dujardin Design Associates, spent months renovating her charming fisherman’s cottage by the sea on Nantucket Island, she did so with the intent of creating a healthy summer home one she could share with family and friends. The sunny rooms, crisp blue and white color scheme and artfully placed seafaring collectibles delightfully proclaim Trudy’s approach to life: at this stage, less is more. Trudy believes that a healthy home is the ultimate luxury, and this house embodies that concept. After testing the older home for lingering toxins in building materials, she removed anything that was less than healthy (built-in shelves tested high for formaldehyde, for example) and replaced them with shelves made locally with solid woods, finished with nontoxic paints. The clean air from ocean breezes is exchanged with inside air every twenty minutes in a state of the art ventilation system that lowers the level of VOCs. There are antique and vintage gems sprinkled throughout the house like shells on the beach, another way to reuse favorite things and save treasures from being discarded. Trudy’s interior design firm recently expanded into a new level of internet-based communications with a fresh website, http://www.dujardindesign.com, and blog redesign (http://www.holistichouse.com), in addition to a Facebook page and Twitter account. The enhanced communications effort will allow Dujardin Design to more quickly and easily share news, decorating ideas and inspiration, and thoughts on living “gently green,” the focus of Ms. Dujardin’s one year-old blog, Holistic House. You can friend Dujardin Design at http://www.facebook.com/DujardinDesign. For more information on green living, fabulous design and photos of inspirational work, follow Dujardin Design at http://www.twitter.com @DujardinDesign. Trudy Dujardin, ASID, LEED AP+ID+C, is nationally known for her passion for eco-elegance, as well as award-winning interiors that combine sophistication, elegant use of color, and an intuitive understanding of her clients’ lifestyles. Her graceful approach to gently green design reflects a deep respect for Historic Preservation, the surrounding landscape, and abundant comfort. Based on her belief that a healthy home is the ultimate luxury, she is a LEED Accredited Professional with a specialty in Interior Design and Construction, recognizing her thorough understanding of green building practices and principles. As an adjunct professor at Fairfield University in Connecticut, she taught the university’s first semester-length course on Sustainable Interior Design. 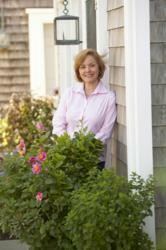 She serves on Traditional Home Magazine’s Green Advisory Panel, has written a column, Gently Green, for Nantucket-based Portfolio Magazine, and is a member of the advisory board of atHome Magazine. From offices in Westport, Connecticut and Nantucket, Massachusetts, Dujardin Design Associates works with high-end clients, architects and developers to create signature interiors, many of which are featured in the design industry’s most prestigious publications. Success is achieved when a beautiful home is also a healthy home.